김일남 박사의 논문이 Science에 accept 되었습니다. 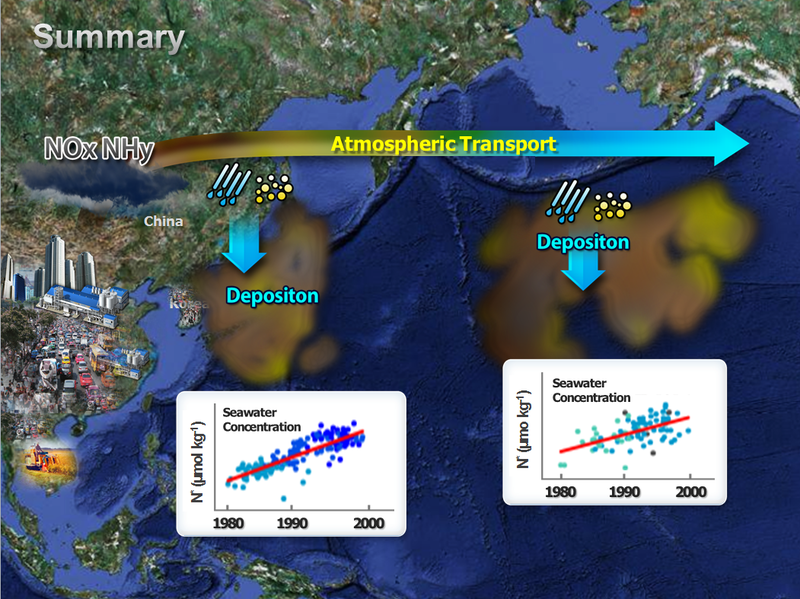 Title: Increasing anthropogenic nitrogen in the North Pacific Ocean Authors: Il-Nam Kim, Kitack Lee*, Nicolas Gruber, David M. Karl, John L. Bullister, Simon Yang, Tae-Wook Kim Abstract: The recent increase in anthropogenic emissions of reactive nitrogen from northeastern Asia and the subsequent enhanced deposition over the extensive regions of the North Pacific Ocean (NPO) have led to a detectable increase in the nitrate (N) concentration of the upper ocean. The rate of increase of excess N relative to phosphate (P) was found to be highest (∼0.24 micromoles per kilogram per year) in the vicinity of the Asian source continent, with rates decreasing eastward across the NPO, consistent with the magnitude and distribution of atmospheric nitrogen deposition. This anthropogenically driven increase in the N content of the upper NPO may enhance primary production in this N-limited region, potentially leading to a long-term change of the NPO from being N-limited to P-limited. 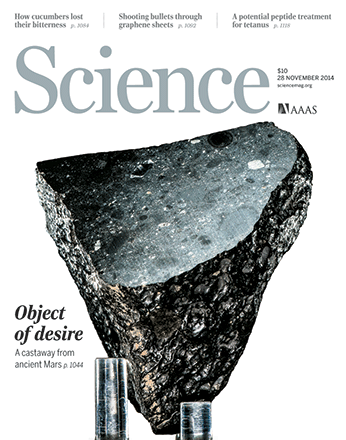 우리 지구 환경 연구실 주도의 논문이 오늘자로 (2014.11.04) Science에서 채택 통보를 받았다. 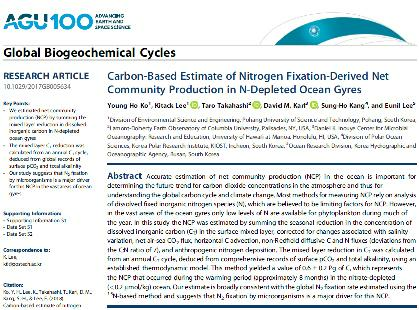 (주저자: 김일남 박사, 교신저자: 이기택 교수님) Title: "Increasing Anthropogenic Nitrogen in the North Pacific Ocean" URL link: http://www.sciencemag.org/content/346/6213/1102.abstract 본 연구는 인간 활동에 의해 발생한 질소 오염물이 대기를 통해 북태평양 전 해역에 유입되고 있음을 처음으로 밝혀 내었다. 이 연구는 한국연구재단 Global Research Laboratory (GRL) 과제를 통해 포항공대 이기택 교수님 팀을 주도로 하여 한국해양연구원 (김태욱 박사), University of Hawaii (Prof. David Karl, USA), ETH (Prof. Nicolas Gruber, Switzerland), NOAA (Dr. John Bullister, USA) 등과 국내 및 국제 공동 연구를 통해서 성과를 이루어 내었다. 2018.10.12 김하련 박사님이 해양수산부 장관상을 수상하였습니다. 김하련 박사님이 전해 학술지에 발표된 논문 중 최고의 논문을 선정하는 상인 '우수논문상 분야 해양수산부 장관상'을 수상하였습니다.여러분의 많은 축하 부탁드립니다. '젊은 과학자상'은 전 해 학술지에 발표된 논문 중 박사학위 후 5년 이내에 발표한 논문 중에서 선정하여 시상하는데, 2018년 추계 한국해양학회에서 박기태 박사님이 '젊은 과학자상'을 수상하였습니다.여러분의 많은 축하 바랍니다. 2018.10.12 김자명 박사의 논문이 Geophysical Research Letters에 게재..
김자명 박사의 논문이 Geophysical Research Letters에 게재 되었습니다. 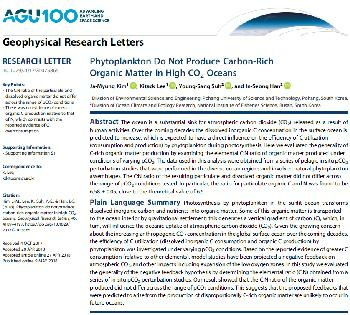 Title: Phytoplankton do not produce carbon-rich organic matter in high CO2 Oceans 여..
2018.10.12 고영호 박사의 논문이 Global Biogeochemical Cycles에 게재..
고영호 박사의 논문이 Global Biogeochemical Cycles에 게재되었습니다 Title: Carbon-based estimate of nitrogen fixation-derived net community production in N-depl..
2018년 5월 24일(목) ~ 25일(금) 제주도에서 열린 '2018년 한국해양과학기술협의회 공동학술대회'에 저희 연구실에서 교수님 포함 12명이 참석하였고, 그 중 3명(고영호, 김자명, 문지영)이 발표하였습니다.